Xandra Kallan - a homicide detective, battles internal turmoil, suffering the aftermath of being caught in the middle of a war, which has left her without the person she needs the most. With her eyes open to the truth and her tortuous past unearthed, she seeks solitude, leaving her haunting past, soul mates, and the place she used to call home in the rearview to soul search with her trusty canine companion by her side - her shield from evil. 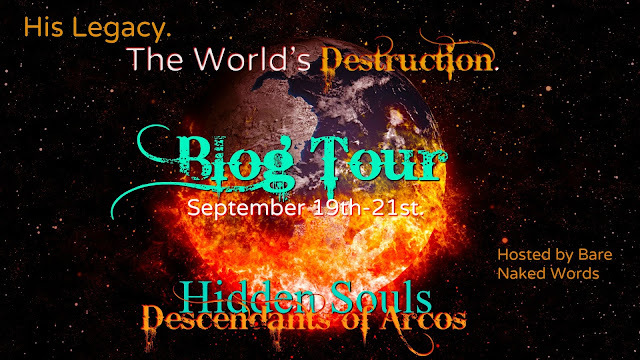 On her road to freedom, Xandra finds herself on the campus of Colorado State University. And reminiscing of her old college days, she decides to re-enter the world of education to become a veterinarian. Little does she anticipate; she will run into a soul just as lost as her. Just as dark. A descendant. And there's more to this soul that meets the eye. When Xandra gains more knowledge about Arcos, she is forced to choose - a decision that could affect the survival of mankind. "You've made your point. You’re a legend; everyone knows your name. Now stop. You don't have to be this person anymore." "Stop? What difference would it make? The damage is done. This is who I am," he growled, pounding his fist to his chest. "This is not who you are; this is what you want everyone to believe. But I know the truth, you’re just like your father. Underneath all that hostility and rage, is a good man. And it would make a huge difference to me if you'd try to change," I said, giving him my irresistible big eyes. He answered with a sigh. "All I'm asking is for you to try." "Because...I want to learn how to love you." 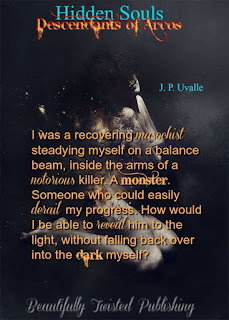 J. P. Uvalle is a beautifully twisted soul who has a passion for writing paranormal romance and has the divine ability to make the unbelievable, believable. She was born and raised in Colorado Springs, went to Bel-Rea Institute of Animal Technology and graduated with an Associate's degree in Applied Science and Technology. JP works part-time as an ICU technician in Highlands Ranch, Colorado at an emergency/specialty hospital. 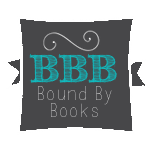 Aside from being a technician and a writer, she runs two businesses in her spare time ~ Beautifully Twisted Publishing, and Mary Kay. On top of that, she also contributes her time to the Beneath the Ashes Blog as a Promotions Manager. When she's not saving lives, coming up with her next plot twist or making women feel pretty & pampered, she's spending time with family and friends. Book One ~ Resurrection of Sin. Nominated in both paranormal and fantasy categories for the Summer Indie Book Awards 2016!